Today we continue discussing the undergarments of the 12” French Fashion Doll. I named this doll Mary Kathleen. I call her “Molly” after my grandmother. The next garment to go on the figure is a corset. I made six of them. The first five did not go so well. Then I changed to a pattern made by someone else. (I will not try my own again; I like this one too well.) Last year, at the UFDC convention, we received a digital journal. A chapter of the journal contained patterns. Lucille Clay’s Lingerie Project was included. Marie Scopel and Susan Sirkis presented the patterns and instructions of Lucille’s project and from this is the pattern for the corset. I did a tiny bit of fitting, but in general, it is the loveliest pattern. I did use a sewing machine and the stays are not whalebone or metal but plastic. You will see in the construction, the corset closed in front with hooks and eyes, and laced in the back through eyelets. The corset is tightly fitting. Very tightly, I can barely get it off and on myself. The lace binding is chain stitched by hand for a nice finish. The eyes added to the bottom of the corset hold the hook portion of the slip. The corset helps support the weight of the slip, and I have taken advantage of the low position to keep the waist small. The slip hooked to the corset is full and trains in the back to support the fullness of the skirt. This formal slip holds more decoration than a chemise or an everyday petticoat. Exquisite work..and I love the way you are presenting these. Very, very nice! Thank-you so much from both of us. 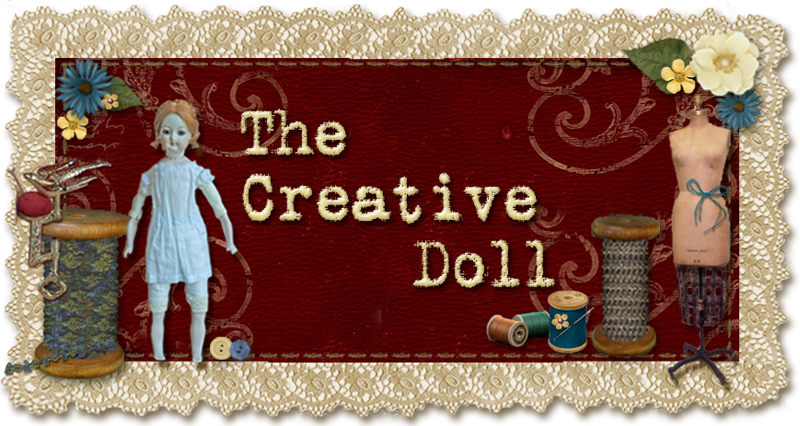 Kathi is the genius behind the doll. I am doing the digital graphic on this series. Shamefully this is why it has taken so long. I had not had time and my old computer could not handle the large amount of data needed to dig into my digital scrapbooking. But I got a new computer with a HUGE hard drive and can unpack all my files. YEAH!